Named after that song from Queen, now I have to program the arduino to recognize an analog input. Meaning, it’s not just as simply flipping a switch. This requires and entirely different mindset. 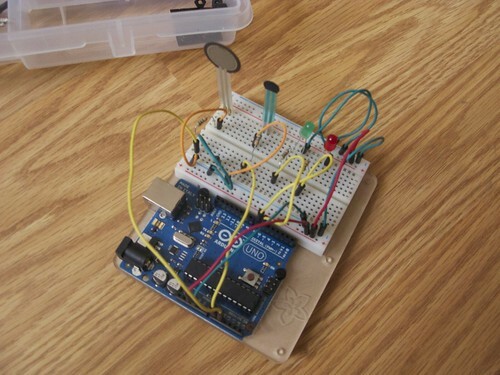 Using a knobthingy commonly known as a “potentiometer”, it allows the light to switch on once you turn it past a certain point. 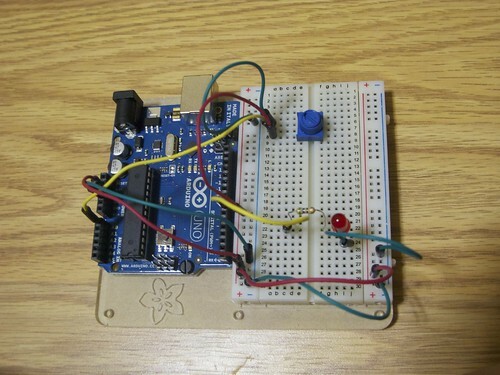 Notice that the potentiometer does not use a resistor and is an exception to the rule. Now I wanted to control the intensity of the LED using a light sensor. So I ended up with this. It still needs a bit of tweaking on the range the sensor recognizes but it more or less captures the desired result. I’m still working on two LEDs and two pressure sensors.